Sniffing in the refreshing aroma from the cup of tea in front of them, are Dandelion, Mumu and Rachael's cat, Blue. I chose them for this painting particularly because their coats are close to resembling the patriotic colours of red, white and blue, as nearly as cat fur can. The brew in this delicate bone china cup is quite safe, far tastier for them would be to lap from a puddle in the garden that they have discovered themselves. Tea has been taken for centuries. It had a long and complex history before being brought to our shores. Ages ago in China it was used medicinally as a herbal remedy. Over the years, those who partook of its benefits, became to love it so much, that it developed into a habit taken purely for pleasure. In the 1800s specially designed Clipper Ships brought consignments of it over for us, where it became highly prized, and often smuggled in, and hidden in caves, sometimes even in Churches. The most famous of these vessels was the Cutty Sark, which made many voyages across the seas to bring tea to our country. My Father, who loved ships, made a detailed model of his favourite, the Cutty Sark. I remember, as a child, watching him making it, often holding his breath with concentration as he assembled the fine riggings, and gradually piecing it together. As I watched him, spellbound, he told me all about Clipper Ships, how they were specially designed to carry tea safely and swiftly from far across the World, for us. He said how they were built to skim the waves, rather than plough through them, giving them greater speed and safety. The Cutty Sark was the fastest of these, and made the most voyages. Built on the Clyde in 1804, it is the sole survivor of these amazing Clipper Ships, and is now in dry dock in Greenwich, preserved for us all to marvel at today. Anna, 7th Duchess of Bedford is reputed to have originated the habit of "Tea Time" as we know it today. To take this reviving brew became the very thing to bridge the long gap between the two main meals. Nowadays, the word Tea, more aptly describes a light snack, rather than a cup of tea on its own. "Tea at the Ritz" is the ultimate indulgent treat for special occasions, where it is ceremoniously served from the best China, and accompanied with neatly trimmed sandwiches, and pretty little cakes. Wherever you drink it, whoever you are, and whatever you drink it from, it remains our most popular drink. We are the world's greatest Tea consumers, and today are spoilt for choice from the hundreds of varieties there are available for the Connoisseur to choose from. Although a cat prefers more rudimentary sources of liquid, Dandelion, Mumu, or Blue will happily sit on your lap as you sip the tea of your choice, enjoying the ambience of peaceful harmony, and sharing the moment. This is how a cat benefits from the habit of Tea. 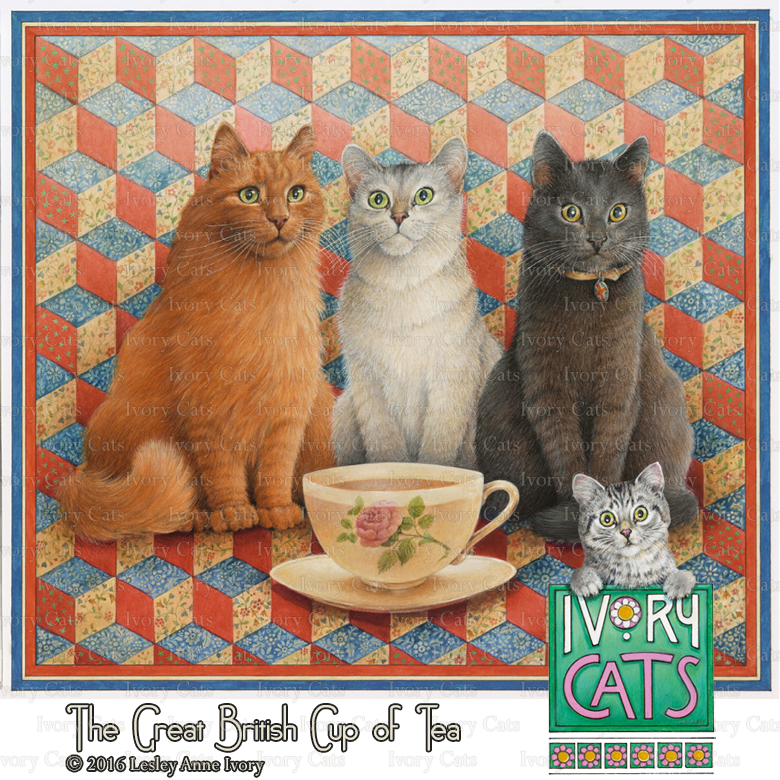 The Great British Cup of Tea, is the largest of my set of paintings celebrating our Jubilee. I made the Tumbling Block Patchwork for their background, against which they may pose and contemplate our love for tea, and wondering what there can be about it that makes us prefer it from a nice muddy puddle in the garden.